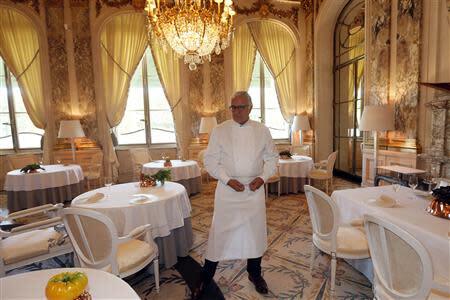 PARIS (Reuters) - In "the prettiest dining room in Paris," hidden behind gilded glass doors at the opulent Le Meurice hotel, Michelin-starred French chef Alain Ducasse is not interested in spectacle. As Ducasse and his head chef, Christophe Saintagne, launch a new menu that eschews over-worked, over-decorated and overly pretentious food, understatement is even the order of the day in the centerpieces - an heirloom tomato set atop a copper mold. 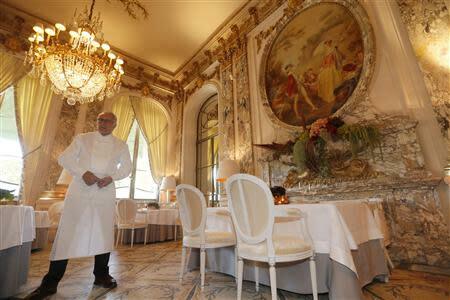 In an interview days before Le Meurice Restaurant's reopening on Monday, the entrepreneur whose empire includes over 20 international restaurants said he wants the cooking, stripped bare of excess and reduced to its essence, to do the wowing in the light, bright dining room that overlooks the famous Tuileries gardens. "We're not going to give you something showy here, we're going to give you flavors, tastes, products, seasoning, cooking. Justice," said Ducasse. "It will be a clear message on the plate so that when you finish the plate it's clear. There is no confusion in tastes," he said. "The wow effect is the taste." The two chefs already collaborate at the Plaza Athenee's three-star restaurant, but that hotel, also owned by luxury hotel operator Dorchester Group, is currently undergoing a partial renovation. Opening restaurants and experimenting with new menus are challenges Ducasse said he thrives on, adding he would be "very frustrated" if he had to limit himself to just one restaurant. "I want to tell a different story here, a contemporary French cuisine in a very, very Parisian address, very, very elegant, because I think it's the prettiest dining room in Paris," said Ducasse, one of France's most trusted voices on haute gastronomie. Decorated in the ornate, feminine style of Louis XVI - beheaded just down the road in the Place de la Concorde - the dining room features light grey marble, tasseled white silk curtains, a pastoral ceiling painting and a gilt frieze, all elements poised to compete with any excessive flourishes on the plate. "On the plate we don't require anything more than taking care of the products and their cooking, their radicalism, their essence," Ducasse said. "There's nothing superfluous." The focus on the essential is also quickly apparent on the menu. "John Dory, turnips, figs" reads the description of one dish. "Seabass, fennel, lemon" reads another menu item. More focus on vegetables is another hallmark. A puree of green black turnip tops dots the plate of John Dory, their peppery flavor playing against the figs' sweetness. A sweetbread is studded with delicate pieces of tomato confit. "Everything that pushes up out of the earth I love. Everything under the earth, root vegetables, I love to cook," said Ducasse. The simple things, and their flawless execution, are what most attract the celebrated chef who still enjoys cooking at home with produce from his garden. His last home-cooked meal? Ducasse is modest. "It was a fish I bought at the market with vegetables from the garden," he said. "You need a good gardener and a good fisherman. The cook is not required."